Slime-San: Superslime Edition is a pixel-based, precision platformer which revolves around speed and accurate inputs to dodge enemies and pass obstacles. Slime-San: Superslime Edition has the player take the role of Slime-San who is suddenly eaten by a large worm and must escape the stomach before he is dissolved by stomach acid. The player will navigate through 100 stages in the main campaign before finally escaping. Lots of Content: Slime-San: Superslime Edition contains 3 separate campaigns. As a result, there is a large abundance of content the player can tackle. The 3 main campaigns contain over 150 separate levels which will challenge the player using various mechanics and gimmicks to solve problems. Despite boasting 3 campaigns, it also includes numerous extra activities such as: locating collectibles in the level which can be used to purchase music, gallery items or additional playstyles. There are also arcade coins that can be used to purchase arcade games. These arcade games are throwbacks to other classic games such as Mario Kart or DOOM and will award the player with additional rewards. In addition to these collectibles, there are also challenges such as target mode where the player is tasked with destroying targets within a certain time limit. Like with the other modes, rewards are given upon completion. There are also music minigames and a Superman 64 parody game available to play. 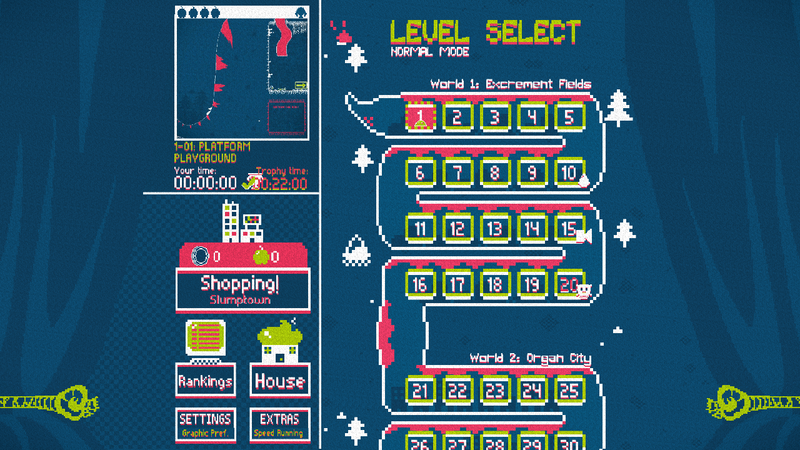 Lastly, the player can complete levels as fast as possible to beat a level’s trophy time. When the player completes a campaign to 100% completion they also unlock a special hidden level; upon completing the campaign once, they also unlock a NG+ version which remixes the levels essentially doubling the existing 150 levels to 300 levels total. 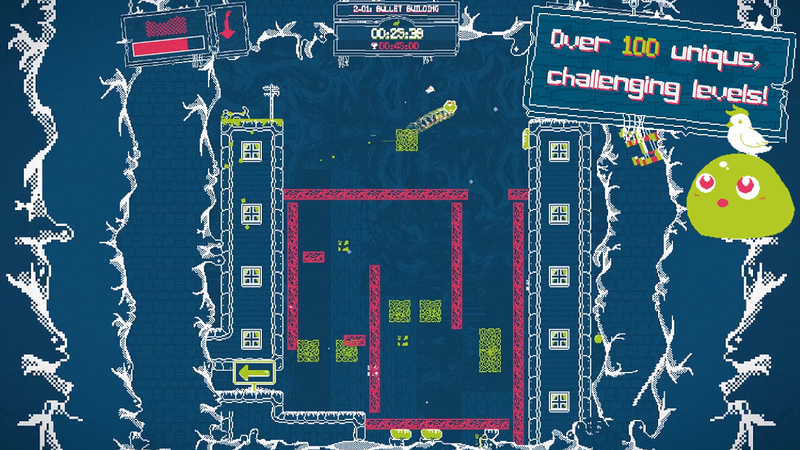 Diverse Gameplay Mechanics: Slime-San: Superslime Edition‘s unique gameplay mechanic is the use of the “Morph” ability. When Slime-San uses this ability, he becomes transparent and can pass through certain green objects, otherwise, these objects will be static and solid. This Morph Mechanic also slows down the level, making enemy projectiles travel slower. This ability can also interact with other mechanics in the game, such as making blocks appear or disappear. 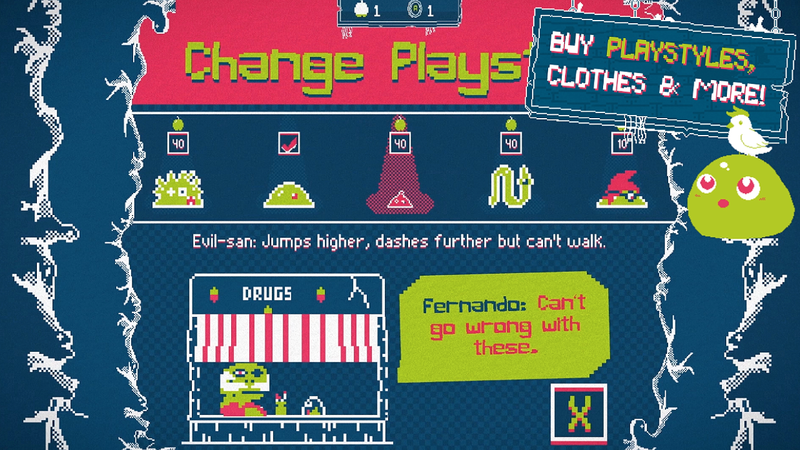 Whilst the Morph mechanic makes Slime-San: Superslime Edition a unique game, its main strength is the number of mechanics that the game includes. In the main campaign, which has 100 total levels, a new game mechanic is introduced every 3-4 levels. This means that gameplay doesn’t get stagnant as new mechanics are always introduced even when the player reaches the final world. The latter levels also start combining many of the earlier traversed gameplay mechanics, making the latter levels become a gauntlet where the player’s skill is truly tested. Collectibles Have Purpose: As stated prior, Slime-San: Superslime Edition has collectibles located throughout the game’s main stages. Collectibles come in 4 main forms: Apples, Bananas, Bugs and Arcade Coins. Each collectible has a different purpose and impact on the game. The most common collectible are the Apples, which are located throughout the main campaign of the game. These Apples can be collected and then used to buy various items such as backgrounds, character cosmetics or playstyles. The Apples are the most important collectibles due to being able to buy playstyles, which is a way to use other characters that play differently to Slime-San. Bananas can be found in the Kraken Campaign and is mainly used toward buying cosmetics for Slime-San’s house. Bugs can be found in the Sheeple Campaign and can be used to buy concept art or music. Arcade Coins are the rarest collectible located in Slime-San: Superslime Edition, these are used to purchase retro arcade parody games which emulate the classics. There are 5 retro parody games which can be bought. Since every collectible has its own niche in regard to what it can unlock, the player can pick and choose to collect those that they have an interest in. The player gets rewarded for going out of their way to collect these additional items by unlocking unique content and additional games to play. Playstyles: The most interesting thing about purchasing additional playstyles, is that all these additional characters have unique passive abilities or character traits which allows them to play differently to Slime-San. Whilst Slime-San is the most basic character, featuring a single jump and single dash, the additional characters can have varied amounts of abilities such has having 2 dashes but a weakened jump height. Each character can independently complete all levels located in the game, meaning there is a tremendous amount of replayability. Each character has drawbacks as well as advantages and it may be useful to switch characters if there are levels the player is struggling on. The inclusion of character playstyles again promotes the idea of exploration and collecting the given collectibles as the player is rewarded for putting in additional work. Badly Designed Gimmicks: As stated prior, Slime-San: Superslime Edition boasts itself by having various amounts of new gameplay mechanics sprinkled in after every few levels varying up the gameplay and deterring monotony. As one might expect, having many gimmicks can definitely have a negative consequence providing if the gimmick isn’t properly designed or fleshed out. The main examples of this can be located in the 2 DLC campaigns, Sheeple sequel and Blackbeard’s Kraken, that have numerous gimmicks which invoke artificial difficulty or break the pace of the game. Slime-San: Superslime Edition is intricately designed, and many enemies or object have nuances to them to allow you to differentiate between similar looking enemies or objects. One example of this are the barrels which can either retain Slime-San inside, where you can launch yourself with the A button, or a separate style of barrel which will automatically shoot Slime-San out instantly. The difference between both of these barrels is a small graphic located on the center of the barrels which allows the players to discern what style of barrel is being used in the level. There are also certain enemies which mimic traditional blocks located in the game and when the player attempts to get near these blocks, these enemies move away, usually resulting in the player missing their jump and plummeting to their death. Since there are no graphics or visual identification to discern which blocks are the mimic blocks, the players must now spend the time to memorize which blocks are fake through trial and error. The player’s skill is not being tested in the form of speed and reflexes, but instead their ability to memorize where invisible platforms are located. 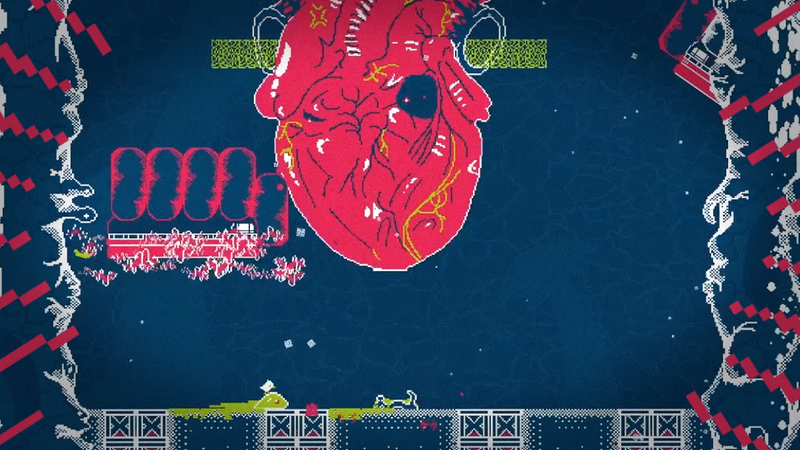 Slime-San: Superslime Edition is a perfect example of how a precision-platformer should be made. The game boasts 3 main campaigns, numerous remixed levels and arcade games. The game rewards exploration and includes many interesting game mechanics to diversify gameplay. Whilst some game mechanics included can invoke artificial difficulty, the overall experience of Slime-san is a positive one. 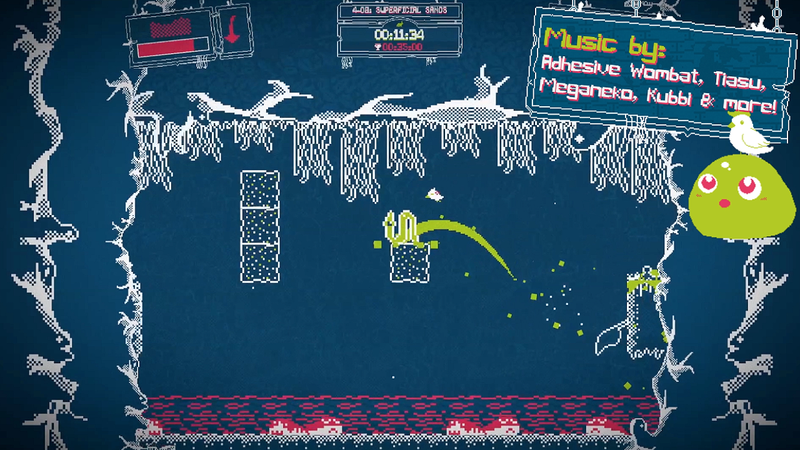 Slime-San: Superslime Edition was developed by Fabraz and published by Headup Games. It was released for Nintendo Switch, PC and Xbox One [reviewed] on June 22nd, 2018. A press review copy was provided for The Hidden Levels. Many studios submit copies for site review but this is in no way factored into our review scores. Games are scored on their individual merits and our rating system is explained here.